The butler’s pantry is a room where food, dishes, and linens were stored and served as an additional space for the kitchen. Primarily found in European homes and dubbed a necessity for the wealthy, butler’s pantries are starting to become more prevalent in the everyday home and are appearing in apartments, condos, and smaller kitchen spaces. For smaller homes like inner city apartments or old Victorian spaces with narrow features, hall closets adjacent to the kitchen are now being utilized as modern day butler’s pantries. Some homeowners may install shelving along the walls to keep provisions like canned foods or jars, items that may take up too much room in their normal kitchen cabinets. Some may install cabinetry where they can keep fine China or seasonal items that may not be needed on a regular basis. If you have are looking for a new way to transform your kitchen closet space contact Domicile San Francisco. This butler’s pantry is modern, yet traditional. 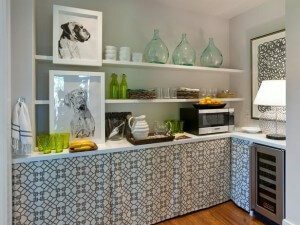 It serves as additional storage for serving and dinnerware and is adjacent to the formal dining room. This type of pantry would work perfectly in a home with a large dining space. 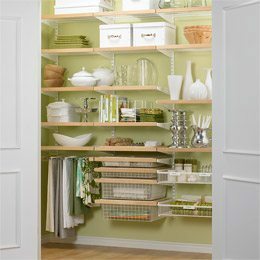 This butler’s pantry as presented by the Container Store shows the usage of shelves. This ideal for small spaces or closets that may not have the depth of a deep closet. Shelves can offer the illusion of more space and provide a great multi-functional platform for storage and display. 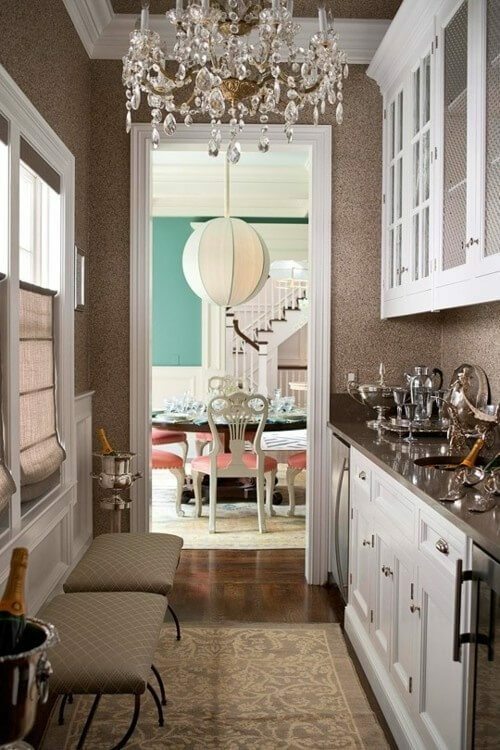 This faux butler’s pantry is a great example of how you can create storage within a room. Shelving was installed high on the wall to keep things separated from the counter space surrounding the room. This can serve as a buffet or sideboard for entertaining. The designer cleverly used curtained doors to avoid taking up space with actual pull-out doors. Another solution could be sliding or pocket doors. This butler’s pantry makes use of a ladder for reaching items on higher shelves. 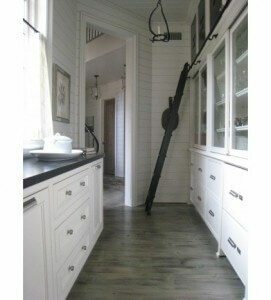 The rail provides mobility across the pantry space. This is perfect for narrow closet spaces that requires using wall space up to the ceiling.